﻿﻿Anchor Cross Ranch's central location and moderate climate makes it the perfect location for year round board. Our winters are mild with a short cold season from mid-December to mid-February. Our summers days are often 10 degrees cooler than Phoenix and the evenings cool off into the 60's even during our hottest month of July. At the onset of Monsoon season the heat of the summer is moderated by cloudy afternoons. Horses at ACR have 24 hour supervision, we live on site and inspect them daily to be sure they are all healthy, sound, and content. If you have a need that requires special attention or veterinarian prescribed care whether it is daily medication, bandaging, measured exercise or just special handling, we will be glad to customize a program based on your needs. We offer space in our 20 x 20 or 16 x 16 mare motels and can provide turn out or limited turn out as required. 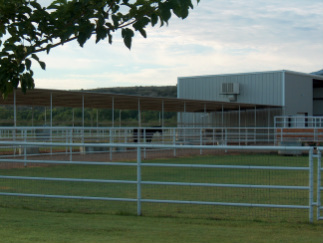 We also have show barn space as available.